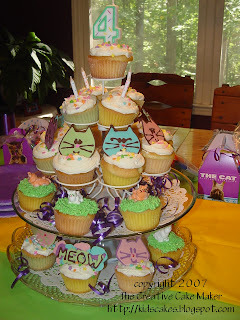 When my daughter finally decided on "The Cat" for her birthday theme (she loves cats) I immediately thought about the cake. Should it be "Hello Kitty"? or "Tom & Jerry" or her beanie baby kittens? or our kittens? or just any cat? What should it look like? White? Black? Calico? I decided I couldn't make just one cat cake. Cupcakes would do nicely. So here we are. 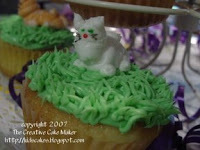 Lots of kitty cat cupcakes. The main cupcakes have cat faces made out of chocolate candy melts and a few of them are an attempt at making cats entirely out of icing. The latter was dreamed up a few days before the party and a search online for something similar brought on ideas for how to go about making them. I thought the icing cats were a complete disaster but the girls (and my husband) thought they turned out great. In fact, they were the first to disappear! For the chocolate candy cat faces, I first drew a template of the cat face I wanted - simple enough to do quickly with not a lot of details. I placed the picture underneath a sheet of wax paper. Once I had my chocolate candy wafers melted, I put some in a plastic sandwich bag and traced the outline of the picture. You can see a video tutorial on how to do this. Once the chocolate was cooled and set, I filled in the rest with another color of melted candy wafers. After that hardened, I peeled the cat faces off the wax paper and placed them in the refrigerator until I was ready to assemble the cupcakes. Once the cupcakes were baked and cooled, I iced a large mound of vanilla icing onto each then sprinkled stars on them. 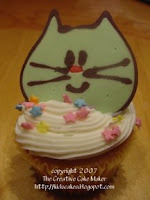 I then placed a kitty face upright in each cupcake. The icing cats were a bit more difficult, and until I perfect them, I think it's best not to share the technique (seeing as how I don't even HAVE a technique for them yet). Just look at the picture and maybe you can visualize what I was trying to achieve. Or, you can see the ones I was trying to model them after on Cupcake Ninja and ooh and ahhh over those. This creative person did an excellent job! I'll just have to find more cake decorating opportunities so I can practice more!